Total Length: 30.11 miles The route continues 20 miles as NC 168 to US 158 in Barco, NC. Creation: Appeared July 1933 as a renumbering of VA 529, VA 532, a little VA 511, a little VA 514, VA 533, and a little VA 513. It originally began on Jefferson Ave a little north of VA 173 near Denbigh running south to Newport News, then used Shell Rd northeast to Hampton, then Back River Rd north to Rip Rap Rd north to King St, then south to the West Branch Hampton River. There was a gap in the route, then another piece existed on Pembroke Ave from the Hampton River east to a little beyond Woodland Dr. See scan with VA 167 entry. This has been the only VA 168. Adjustments: In Sept 1934 (CTB), VA 168 was extended north to VA 174 (now Lebanon Church Rd) near Lee Hall. 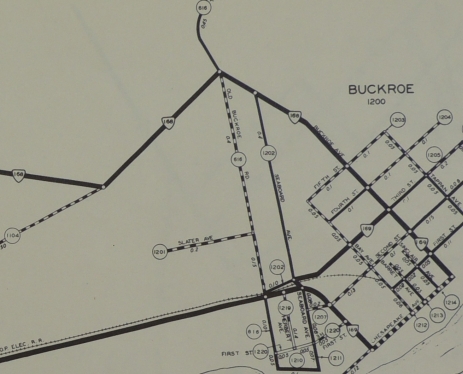 In Aug 1936 (CTB), VA 168 was extended east to end at VA 169 Buckroe. VA 168 ended at Buckroe Ave/3rd St jct. See scans in VA 167 and VA 169 entries. In March 1937 (CTB), VA 168 was rerouted in Newport News to "run from Marshall Ave to 34th St and over 34th St to Jefferson Ave." This is a clunky way of saying that VA 168 was placed on one-way pairs using 34th/35th Sts. In Nov 1937 (CTB), VA 168 was extended north as new routing to US 60/VA 31 Williamsburg. In May 1938 (CTB), VA 168 was extended north with VA 31 (now VA 5) to Camp Magruder, then northwest as new primary routing to near Andersons Corner, then duplexed with VA 30 to Barhamsville, then as new construction over to VA 33 near Angelview Church. In Dec 1939 (CTB), VA 168 was removed from Buckroe Ave (became SR 1104) and placed on Pembroke Ave (new construction) near Buckroe Beach, changing its endpoint at VA 169. In June 1944 (based on an item in the Jan 1945 CTB), VA 168 was rerouted to stay on Jefferson Ave down to the ferry to Norfolk then picking up Taussig Blvd to Little Creek Rd east to US 60 at Little Creek (all replacing VA 165). 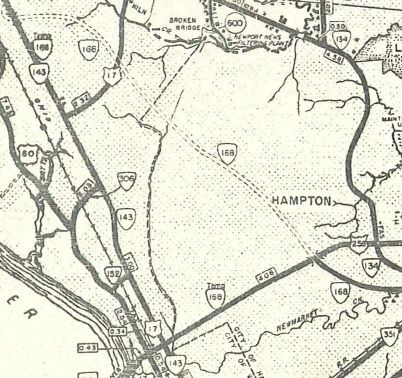 The part east to Hampton became VA 143 and east from there to Buckroe became VA 351. Some of the VA 351 routing has changed, notably Shell Rd is no longer primary. 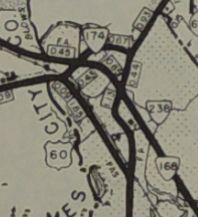 In Sept 1945 (CTB), VA 168 was placed on a new bypass east of Williamsburg, leaving behind VA 162 2nd St and VA 31 (now VA 5). 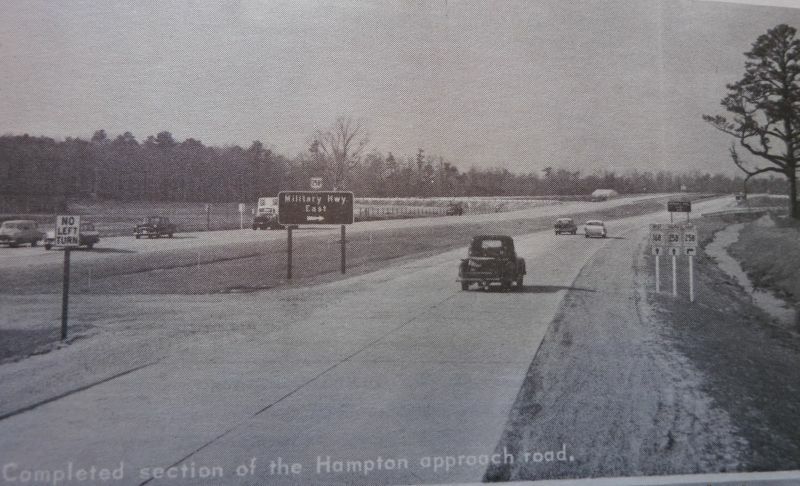 In Nov 1957 (CTB), VA 168 was removed from Jefferson Ave below what is now I-64 near the Newport News Airport and placed on the new Hampton Roads Bridge Tunnel, then with US 60 in Ocean View, then put on newly constructed Tidewater Drive into central Norfolk, then duplexed with US 460 across the Elizabeth River, then replaced VA 170 through South Norfolk and Great Bridge down to the North carolina line. 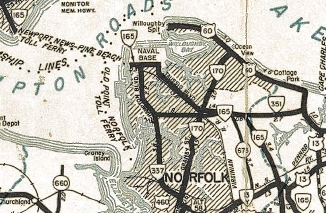 The old route became VA 143 on Jefferson down to central Newport News; a bit of VA 167 on Jefferson down to 16th St; the ferry was discontinued; VA 170 on Taussig Blvd and Little Creek Rd over to US 60. The new expressway was not completed between Jefferson Ave and US 258, so a TEMP VA 168 was in place on Jefferson and US 258 to provide continuity for VA 168. 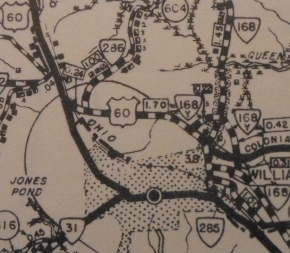 In 1960 or 1961, VA 168 actually existed on I-64 from US 258 to Jefferson Ave. In Oct 1965 (CTB), VA 168 was formally placed on more I-64 from Jefferson Ave all the way out to the current VA 30 (exit 227) interchange. The old route became more VA 143 to Camp Peary; VA 168Y from I-64/SR 607 towards Andersons Corner; SR 645 (now SR 746); the remainder kept being part of VA 30. Of course, I-64 out that way wasn't actually finished fully until 1975. See scan under VA 168Y entry. Around 1970, VA 168 was taken off Oak Grove Rd between I-64 and VA 190 and placed on Battlefield Blvd. About 1980, VA 168 north was truncated to its current north end, leaving behind US 60, I-64, VA 30 and an extended VA 249. In March 1981 (CTB), VA 168 was placed on the new freeway around the east side of Great Bridge (which was actually added to the primary system unbuilt in March 1973 CTB), leaving behind VA 168 Business. See scan in VA 168 Bus entry. Around 1999, VA 168 was placed on the new freeway connecting the noth end of the Great Bridge Bypass to I-64/464. VA 168 was then added to I-64 back over to Battlefield Blvd. This left behind more VA 168 Business. See scan in VA 168 Bus entry. Also around 1999, VA 168 was removed from Campostella Rd below VA 246 and instead is now using Shop St and Atlantic Ave which turns into Battlefield Blvd. In 2001, a new toll expressway was built from the south end of the Great Bridge Bypass most of the way to the NC Line. The old route became more VA 168 Business except the last loop at the east end of old VA 193 Ballahack Rd is now unnumbered (and doesn't connect to VA 168 at its south end). VA 168 was paved north to US 17 (now VA 306) in 1936. VA 168 has been fully paved everywhere since 1938. 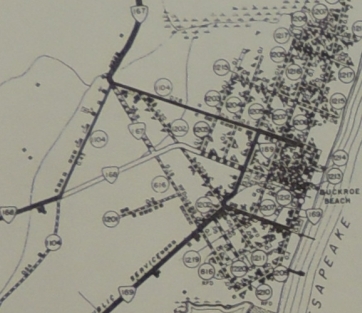 Between 1942-47, VA 168 was multilaned on Little Creek Rd between Taussig Blvd and Military Hwy; also it was multilaned from Newport News to a little past Camp Peary. 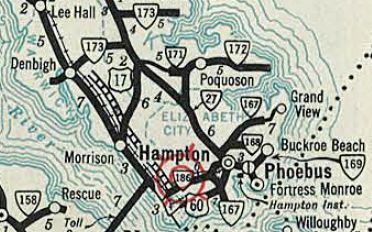 In 1957, VA 168 was multilaned from Camp Peary to SR 746 near Andersons Corner. 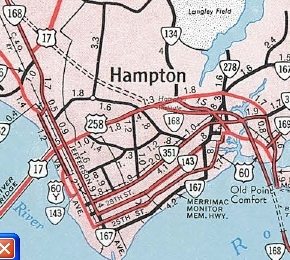 In 1958, VA 168 was multilaned on its new expressway in Newport News and Hampton, its US 60 duplex in Ocean View and on Tidewater Drive down to Princess Anne St. In 1970, VA 168 was multilaned from US 13 Military Hwy south to Great Bridge. 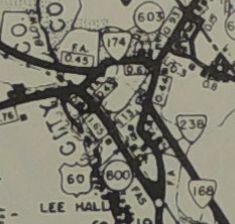 In 1973, VA 168 was multilaned on its VA 30 duplex south of I-64. 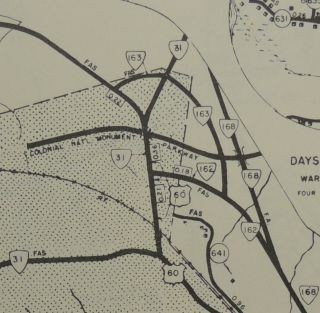 In 1975, VA 168 was multilaned on its new I-64 duplex to Exit 227. In 1990, VA 168 was multilaned across the Elizabeth River to the US 460-VA 166-VA 168 split. 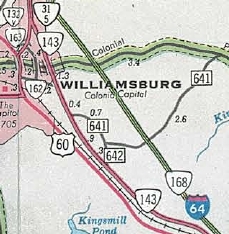 In 1999, VA 168 was multilaned on its Great Bridge to I-64/464 connector, plus from US 13 north to US 460/VA 166 (official maps still show north of VA 246 as 2-lane). In 2001, VA 168 was multilaned from the south end of the Great Bridge Bypass to the NC Line. VA 168 is multilaned throughout now, with full control access from I-64 south to nearly the NC line. Posted: Fully posted; last known cutout was on Tidewater Dr north of VA 165, still there in 1992. Several "flattop" 168 shields (similar to an Interstate shield but with a flat top) exist in Norfolk. Error US 168 trailblazers exist on VA 166/Princess Anne Rd. Circle 168 shields exist southbound at VA 247/Lafayette Blvd in Norfolk. Comment: VA 168 serves as a major thoroughfare for Norfolk area travelers to head for the Outer Banks of North Carolina. Tidewater Dr near and north of I-64 in Norfolk has some grade-separated interchanges, most notably at VA 165/Little Creek Rd and at US 460/Granby St. 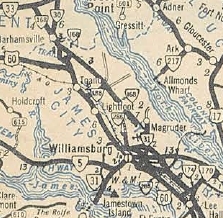 The 1935 Official erroneously shows VA 168 as VA 186.